Students with White-Gold Belts will be taught basic karate skills. These students will be taught to correctly punch and block – with more focus to 4 basic kicks; front, round, side and back kicks. They will also be taught self-defense with an attention to grabs, submissions, blocks and strikes. Forms will also be introduced and reinforced. 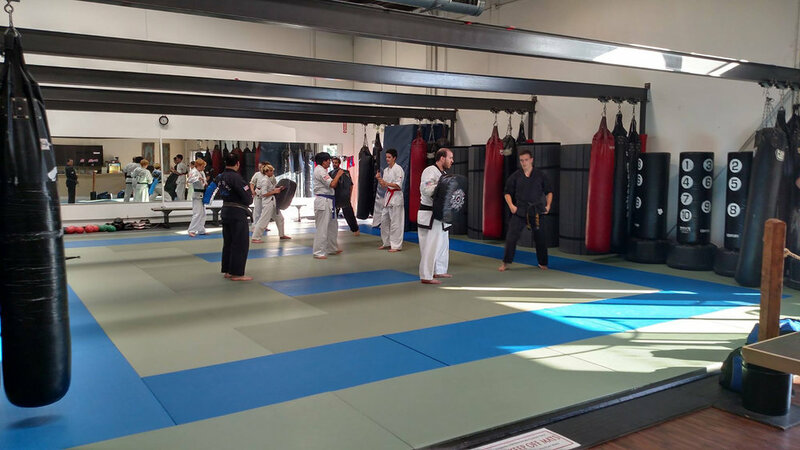 Students who advance to Purple through Orange Advanced Belts will take all previous instruction and build on this and add to their core curriculum. More focus will be paid to making their movements more fluid and more powerful. Purple advanced belts will be given the opportunity to break boards. This group of students are also introduced to sparring. Not only will they learn how to spar with proper technique and form but also be taught to respect the responsibility that comes with this level of curriculum. Advanced Belts will cover all previously taught forms and techniques, but a degree of difficulty and higher expectations will be placed on these students. Advanced kicking such as pop up kicks, jump kicks and spinning kicks will be introduced. They will be taught how to properly fall and roll, how to perform take downs and ground work.